LIGO’s Asian cousin will this year deploy ambitious technology to improve sensitivity in the search for these faint, cosmic ripples — but its biggest enemy could be snowmelt. Inside a house-sized scaffolding wrapped in thick plastic sheets, Takayuki Tomaru is in full clean-room attire. The physicist is performing one of the most delicate and crucial tasks in the construction of a gravitational-wave observatory: installing one of the machine’s four mirrors, each a 23-kilogram cylinder of solid sapphire known as a test mass. When operations begin later this year, their job will be to bounce infrared-laser beams back and forth along two 3-kilometre high-vacuum pipes, ready to sense the passage of gravitational waves. 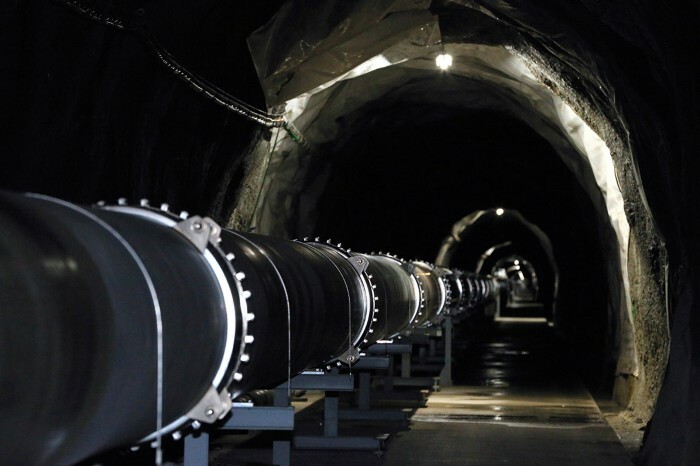 The ¥16.4-billion (US$148-million) observatory — Japan’s Kamioka Gravitational Wave Detector (KAGRA) — will work on the same principle as the two detectors of the Laser Interferometer Gravitational-Wave Observatory (LIGO) in the United States and the Virgo solo machine in Italy. In the past few years, these machines have begun to detect gravitational waves — long-sought ripples in the fabric of space-time created by cataclysmic cosmic events such as the merging of two black holes or the collision of two neutron stars. With the addition of KAGRA, the growing global network of detectors will enable astrophysicists to locate the position of these feeble cosmic signals in the sky with greatly increased precision. They will be able to dissect the waves’ properties, such as how they are oriented in space, better than ever before, ultimately allowing them to learn more about the elusive cosmic objects that produce them. But KAGRA will not just be more of the same — it will break new ground in several ways and could prove to be an important testbed for future detectors. “﻿KAGRA is carrying out tests of two concepts that may prove important for the future of gravitational-wave astronomy,” says Rainer Weiss, a﻿ physicist at the Massachusetts Institute of Technology in Cambridge who co-founded LIGO. One is that it is the first major interferometer to be built underground. Its two arms stretch inside tunnels under Mount Ikenoyama, near Japan’s north coast (see ‘Japan’s wave hunter’). 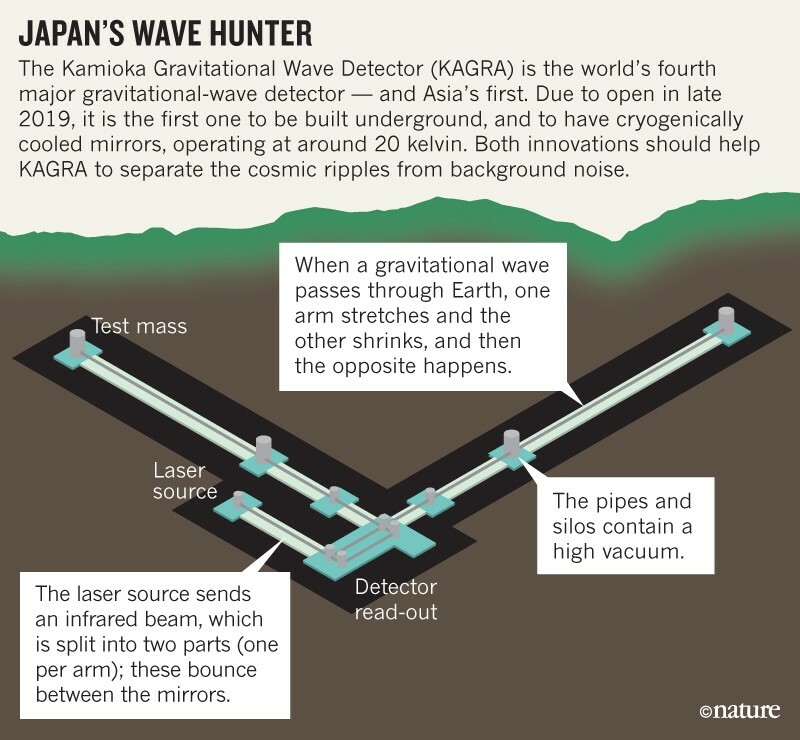 “We believe this is an advantage, because seismic noises are typically two orders of magnitude smaller underground,” says Takaaki Kajita, a physicist at the University of Tokyo who is KAGRA’s principal investigator. And whereas LIGO’﻿s and Virgo’s mirrors operate at room temperature, KAGRA’s will be kept very cold, at 20 kelvin, to cut down noise from thermal vibrations. If KAGRA works as planned, it could provide crucial know-how for the field. The use of cryogenics, in particular, might be essential if future detectors are to offer vastly improved sensitivity, says David Shoemaker, a physicist at the Massachusetts Institute of Technology in Cambridge who is LIGO’s spokesperson. Japan was an early starter in the race to detect gravitational waves, whose existence Albert Einstein predicted more than a century ago. Researchers at the University of Tokyo built prototype interferometers in the early 1990s, following work by physicists in the United States, the United Kingdom and Germany. When TAMA, a machine with 300-metre arms, began operating in Tokyo in 1998, it was the largest, most sensitive detector prototype in the world, says physicist Raffaele Flaminio, who has for several years been a leading KAGRA researcher at the National Astronomical Observatory of Japan. But TAMA wasn’t expected to make a discovery. Because gravitational waves stretch the dimensions of space, their effects are more noticeable over longer distances, putting smaller detectors at a disadvantage. Moreover, human-generated vibrations made TAMA — located in Tokyo — a non-starter, Kajita explains. In the 1990s, researchers in Europe and the United States secured funding to build two 4-kilometre interferometers in Washington state and Louisiana (LIGO), and a 3-kilometre machine in Italy (Virgo), but Japanese physicists faced an uphill struggle for funding. 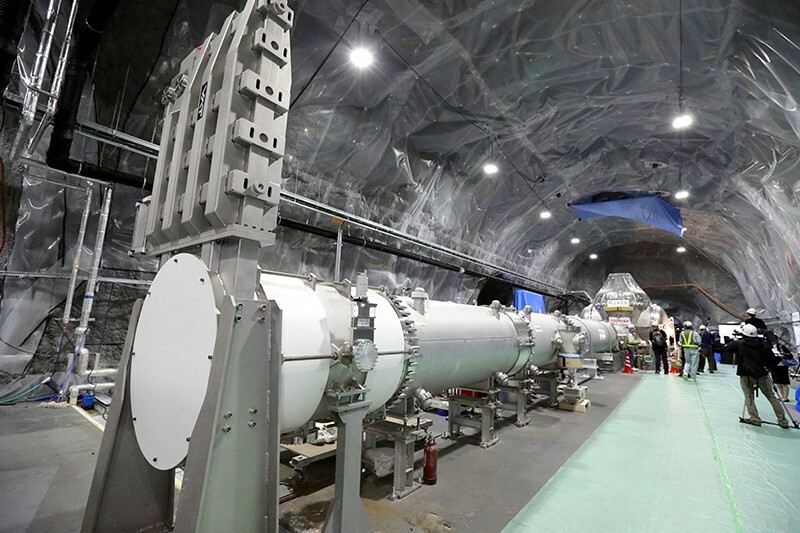 A further setback came in 2001, when a serious and costly accident at Super-Kamiokande, a massive neutrino observatory also under Mount Ikenoyama, made the Japanese government wary of funding big-science projects. Still, Japanese researchers kept working on interferometer development, pursuing the cold-mirror route. In 2006, the Cryogenic Laser Interferometer Observatory (CLIO) began operating in a tunnel at Kamioka. The 100-metre prototype was the first to have cryogenically cooled mirrors and took two decades to perfect, Kajita says. That’s in large part because cryogenic cooling poses a conundrum for gravitational-wave science. “Coolers are mechanical things,” Kajita says, so they create vibrations of their own. Researchers had to work out how to keep the coolers in physical contact with the mirrors’ suspensions — so that they could keep the mirrors cold — while not letting the coolers’ vibrations creep in the opposite direction. In 2010, Japan’s parliament approved funding for the project, to which countries including South Korea and Taiwan also contribute. KAGRA’s name — chosen from 600 suggestions made by the public — is also a reference to kagura, a dance to the gods that is part of Japan’s ancient Shinto tradition, says Miyoki, who has worked on TAMA and CLIO, and now leads the KAGRA lab. Construction began in 2012, and KAGRA’s 6 kilometres of tunnels were dug in less than 2 years. But the location also poses a problem: the mountain’s rock is porous and soaked in water. KAGRA physicist Keiko Kokeyama recalls visiting the site in 2014, when she was working on LIGO at Caltech. “Inside the tunnel, it was raining very hard,” she says, and the floor was covered in mud. Keeping the tunnels dry required installing an extra layer of lining, says Kokeyama, who oversees the interferometer’s laser source, among other things. During a reporter’s visit to the lab in September 2018, Tomaru, a KAGRA physicist from the High Energy Accelerator Research Organization (KEK) in Tsukuba, was fine-tuning the installation of one test mass, which hung in a black hi-fi-sized structure from four 1.6-millimetre-thin fibres, also made of sapphire. The structure was due to be installed in the vacuum chamber, isolated from any seismic disruption. KAGRA team members installed the final test-mass in early December. The team hopes that the machine will be ready before the end of 2019, in time to join a year-long observation run that LIGO and Virgo are due to start in March. When KAGRA starts up, the world’s gravitational-wave community will be watching. LIGO is planning an upgrade called LIGO Voyager that will also have cold mirrors — although not as cold as KAGRA’s. And the US community is designing a 40-kilometre cryogenic machine called Cosmic Explorer. Researchers in Europe hope to build an observatory called the Einstein Telescope, which will be a 10-kilometre-sided triangle, and will be both cryogenic and underground. “I believe people will learn from KAGRA,” says Kajita.